The thing is about toilets, is that there are just so many different options to include. In our last blog, we started to cover some of the most common different types of toilets that you could have in your home. But we just scratched the surface. In this blog, we will talk about some of the toilet options that you may not have been aware of previously. This toilet comes with a sensor that you just wave your hand over to make it flush. It helps stop the spread of germs and is available on any level of water saving toilet. This can also be added to a regular flushing toilet, and it is battery powered. This may seem like something out of a sci-fi movie, though what film showcases a toilet? But the toilets of the future are upon us. Some of you may be familiar with Japanese toilets that are known for including all sorts of features. These intelligent toilets can feature an ambient lighting system, Bluetooth speaker technology, seat warmer, foot warmer, and a motion-activated opening and closing of toilet cover. These are just some of the features that you can expect in an intelligent toilet. But know that you will be paying for these features. These toilets have a pretty high price tag. If you are looking for a sleek design or have limited space in your bathroom, a wall hung toilet may be for you. This toilet has the tank inside of the wall, and only the seat and the bowl are visible. If you are looking to redesign your bathroom and have questions about what would be the best toilet to install, please give us a call. We are very familiar with any toilet option and would be happy to talk with you about what would be the best fit for your bathroom. We are also more than happy to install any toilet that you may purchase. 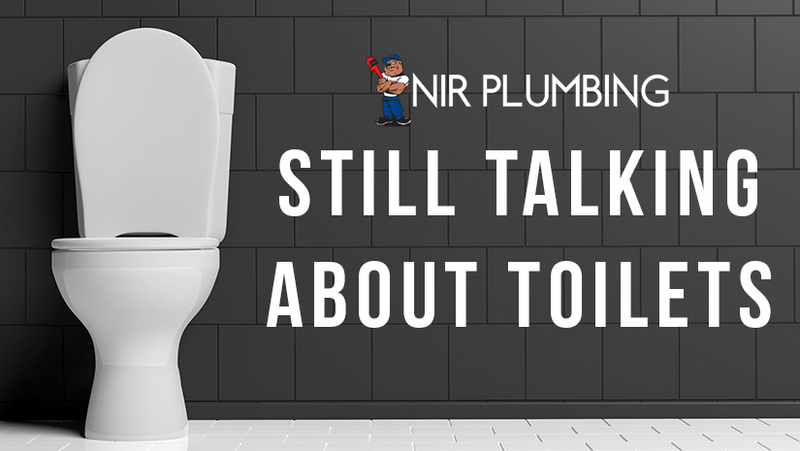 Please call NIR Plumbing for all of your plumbing needs.